Repealing and replacing Obamacare was supposed to be the easy part of Ryan’s revolution. The current mess in which the GOP finds itself concerning the long-discussed but imperfectly planned repeal and replacement of Obamacare is a big deal by any measure, considering the real-life stakes and the many promises Republicans, from Donald Trump to the lowliest House member, have made to rid a suffering nation of this modern form of slavery as quickly as possible. But there are broader implications as well. Action on health care was supposed to be the first (and easiest!) of an audacious series of actions the trifecta-winning GOP would take in this calendar year to erase the Obama legacy and send the country down a decisively conservative path. As you may recall, the idea was that Republicans would use a budget resolution for the current fiscal year to repeal Obamacare and defund Planned Parenthood, the two priorities so high for conservatives that many of them were willing to shut down the federal government over them. With that out of the way, and the budget baseline set with lower deficits (real or imagined), the table would be set for a second budget resolution — this one next fiscal year — that would massively cut taxes and perhaps reduce entitlement spending (though one entitlement, Medicaid, might well be hammered in the first bill). And finally, perhaps between the first two bills and perhaps later, Republicans would use the appropriations process to boost defense spending and slash nondefense discretionary programs, especially those benefiting the poor folks who don’t tend to vote Republican. It was obvious all along that timing and momentum would be critical to this kind of legislative blitzkrieg, complemented by an executive-order program that would kill Obama priorities legislation couldn’t quite reach quickly enough. And that’s why the train wreck over health-care policy endangers everything Republicans are trying to do. They are too far down the road to that first budget bill to turn back. But any scenario to resolve the internal differences among Republicans, which are magnified by House and Senate conflicts, would take time and might lose crucial votes. And the ultimate fallback plan involving Democratic votes and some sort of health-care “fix” that will be viewed as “betrayal” by conservatives, would take even longer and create even more political problems down the road. To mention just one bit of collateral damage from a perpetually delayed or bipartisan health-care bill: It would almost certainly involve shifting nonnegotiable conservative demands for the defunding of Planned Parenthood to the appropriations arena, where a Democratic filibuster and ultimately a government shutdown could ensue. And that could represent the death of the impression that a triumphant GOP is bending Washington to its will. Republicans have planned all along to follow up on the Obamacare repeal-and-replace legislation with a second health-care bill that takes care of things that cannot be done in a budget bill, like the revocation of regulations and such new nonfiscal provisions as interstate health insurance sales. The idea is that after Obamacare was dealt with, Democrats might well go along with such provisions in order to improve the system — not an unimportant asset since such legislation would require 60 Senate votes. Without the Obamacare repeal and replacement, Democrats might see no need for helping the GOP with this chore. And since the American Health Care Act includes more than $800 billion in tax cuts and well more than a trillion dollars in budget cuts, a stalled or abandoned bill would add that much more pressure to the amount of tax and budget cuts that would have to be accommodated in the second, FY 2018 budget resolution and reconciliation bill — and would make it one of the largest such measures since at least the first year of the George W. Bush administration. That is inherently dangerous, and could lead to diminished achievements if Republicans don’t stick together — as they have not stuck together on health care. And there would be less time to work through potential differences of opinion. Worse yet, if the overall timetable falls apart and key GOP legislative goals slip into 2018, all the complications of a midterm election atmosphere—where Republican are already expected to lose House if not Senate seats—will come into play. And beyond that, Donald Trump’s promises to change Washington forever and Make America Great Again will start to look more than a little like the stuff politicians always say and never accomplish. So figuring out how to resolve the health-care challenge in a big hurry should be Job One for Trump, Paul Ryan, and Mitch McConnell — if, that is, they are all still on the same page. If so, they could always do what Democrats did in 2009 and 2010, and use their muscle and party discipline to force through health-care legislation whether it was popular or not. After all, what is partisan power for if not to risk it by actually doing something? 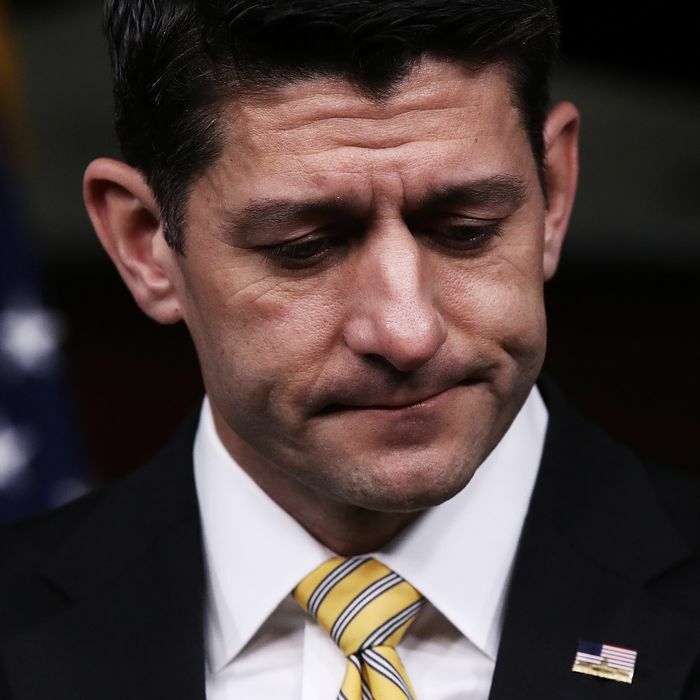 If Republican leaders are not, however, really thinking along the same lines, this mess could be the new normal, and the stunning GOP triumph last November might have been an illusion.